Titanium is a space-aged material trusted by NASA and the aerospace industry for its strength and lightweight. Titanium wedding bands share the same durable properties that NASA has used for years in their space program and companies like Boeing have utilised for making large aircraft. 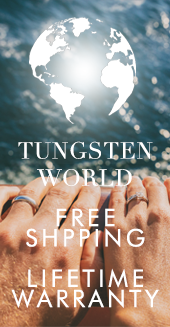 It is with this attention to detail and commitment to long-lasting materials that each titanium ring from Tungsten World is made into the perfect forever wedding band. Several times hard than gold rings, titanium wedding bands exhibit a superior scratch resistance and resilience to bending not seen in traditional yellow or white gold rings. 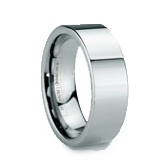 At the same time, titanium wedding bands remain shatterproof and will not tarnish. In fact, titanium is well known for having the highest strength-to-weight ratio of any metal. 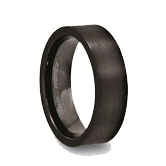 Titanium rings and titanium wedding bands come in a vast variety of styles, widths and sizes. Due to its inherent malleability, titanium wedding bands can be crafted into everything from brushed to high polished finishes, faceted to tension set styles, and precious metal inlay to diamond ring varieties, making the options almost unlimited for your wedding band. Titanium has a modern graphite grey color in contrast to gold’s traditional yellow hues. Like gold rings, titanium wedding bands are also available in a variety of color and finish combinations. 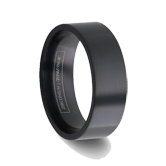 In addition to the traditional grey metallic color of titanium, there are also varieties of black titanium rings, gold-plated titanium bands, titanium rings with precious metal and carbon fiber inlays and a variety of brush finish options that will alter the appearance of titanium. Titanium is several times harder than gold and slightly harder than even platinum. As a result, it will resist scratches better than precious metals. The weight of titanium is classified as “featherlight,” hence one of the reasons it is used in aircraft manufacturing. In addition to being lightweight, titanium is very strong. The strength-to-weight ratio of titanium is the best of any metal. As a result, titanium wedding bands will not fracture or break, and while gold rings can bend out of shape easily, titanium’s superior strength will keep the ring intact. 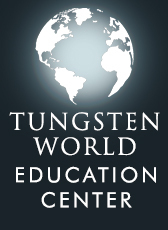 Only at Tungsten World can you get a truly custom engraving on your titanium wedding band. It is possible to have any of our rings engraved using our laser etching system. To have a ring engraved, select the product and click "Add Laser Engraving" above the red "ADD TO CART" button. Type your message in the text box and wait for your message to appear, you can select between the different fonts to the one you desire. 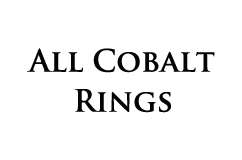 After you have confirmed your engraving for spelling, capitalization, and spacing; click the "I confirm..." button to proceed with your order. The cost for etching is $25 per ring, and may take 1-2 business days. We are able to engrave up to 30 characters per ring (counting spaces). Once the item is in your shopping cart, please confirm your personal message for accuracy before continuing the checkout process. Congratulations, your personal interior engraving will appear as it does on your screen when your ring is delivered. Already received your ring? 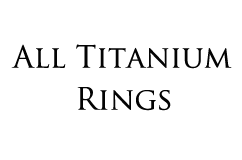 Click here to print out an engraving sheet with our fonts. Titanium is 4x harder than silver, 3x harder than gold and about 2x harder than platinum, the result is a titanium wedding band that is going to resist scratching much better than its precious metal counterparts. In addition to its hardness, titanium has an inherent strength. Titanium rings are shatterproof and will not chip or crack. Titanium wedding bands are featherlight, making them some of the most comfortable rings for everyday wear. Titanium wedding bands will not tarnish unlike some gold and silver rings. In the event of an emergency, titanium rings can be cut off by medical professionals. Titanium rings are hypoallergenic and biocompatible. Materials used in some gold and silver rings will cause their wearer to develop a rash making them unable to wear their ring. With titanium wedding bands, you will not experience this problem. Titanium is the element at 22 on the periodic table. As a transition metal, it is in a group with other familiar metals like silver, gold, platinum, tungsten and cobalt.. Discovered by William Gregor in 1791, titanium was named after the Titans from Greek mythology by Martin Heinrich Klaproth. 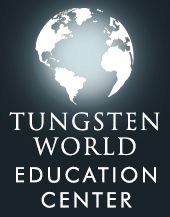 As a raw element, titanium is both lustrous and highly resistant to corrosion. Like Cobalt Rings, the titanium used in Titanium Wedding Bands is an alloy (Learn more about the differences between these two metals here, Cobalt vs. Titanium). By alloying titanium, a higher quality metal is created, accentuating the desirable attributes of natural titanium. Titanium alloys are graded based on their quality and uses. The most common titanium grades for jewelry are Ti-64 - Aircraft grade titanium, Ti-662 - Super hard titanium and Ti-999 - Commercially pure titanium. In addition to wedding bands, titanium has numerous uses. Being a lightweight, strong metal, titanium is a superior building material in many instances while also being cost effective. In addition to its use by NASA in space shuttles, the titanium is also used in airplanes, golf clubs, medical implants and the automotive industry. Titanium wedding bands are yet another of the long line of uses this versatile and corrosion resistant metal has greatly benefitted.